In the first of several major product changes that will sweep through AOL in the coming months, the company is adding more lifestreaming capabilities to its Bebo social network today, including activity stream updates from rival social networks Facebook and MySpace. It is also introducing a visual timeline called a “Lifestory” that puts uploaded photos, events, and (soon) videos into a scrollable, chronological series of postage stamp icons at the top of members’ profile pages. Eventually, people will be able to subscribe to other Lifestories, including those from brands and bands, and embed them in their own profile pages or elsewhere. The timeline will also become the centerpiece of a Bebo iPhone app coming out soon. The new features should all help to reinvigorate a site that has been in the doldrums lately. 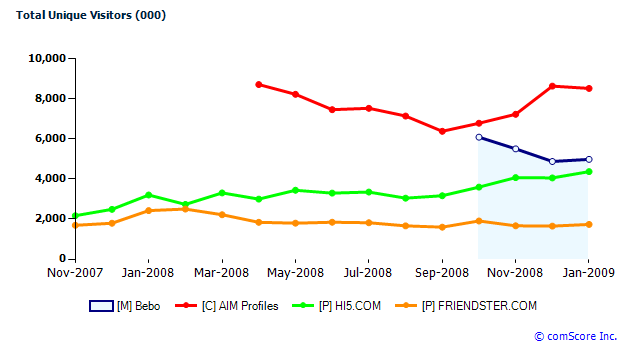 But Bebo’s biggest boost will come later this week when AOL migrates all of its AIM Profiles members over to Bebo on Wednesday and Thursday. This single move will more than double Bebo’s presence in the U.S., where AIM Profiles is even bigger than Bebo. According to comScore, Bebo’s unique U.S. visitors have been in decline the past few months to 5 million in January, whereas AIM Profiles has seen an upswing to 8.5 million. (See chart below). Worldwide, Bebo has 22.6 million monthly visitors. At the center of AOL’s new product strategy is its “Lifestream Platform.” Think of it as FriendFeed for the masses, with personal AIM updates mixed in. Already, Bebo members are able to keep up with their friends’ activities on other sites, such as Flickr, Twitter and Delicious. Now Facebook, MySpace and YouTube are being supported as well. Whenever any of your friends do something on these services, their activity stream shows up on your Bebo page. Once you link an account to Bebo, it automatically keeps track of all of your new friends on that service as well. (The technology is based on AOL’s acquisition of Socialthing! last summer). If you are an AIM member, all of your AIM buddies now seamlessly appear on Bebo. And through Bebo’s recently launched Social Inbox, you can get all of your lifestream updates, instant messages, and email in one massive feed. We are not trying to connect everybody to everybody—that is Facebook—just to the content and people important to them. Bebo is just the beginning. He plans on rolling out the Lifestream platform across revamped versions of AOL’s IM clients (AIM and ICQ), mobile apps, and even other Websites later this year. 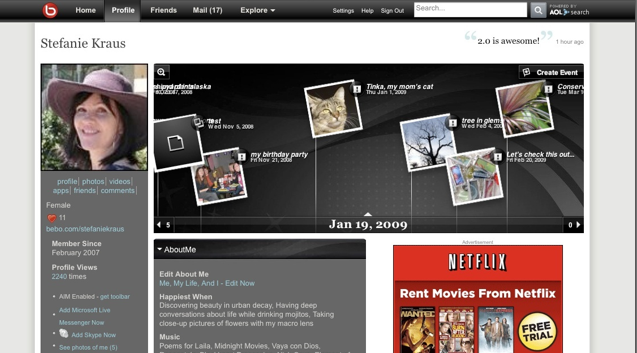 Regardless of any second thoughts that AOL may have had after buying Bebo, it is a central part of its strategy today. AOL has a huge and active group of millions of IM users that it has been wanting to turn into a social network for years. Now it has a place for them to create profiles and interact, but more importantly it can take the central communication model of social networks—the lifestream—and pour it back into its IM clients. It is an ambitious undertaking. But will AOL’s take on lifestreaming be compelling enough to keep existing members from leaving? And more importantly, will it be compelling enough to attract new members from eleswhere on the Web?